I love Harry Potter and am a FANATIC! The HBP is my favorite book in the series and I was psyched to see the movie. There was a lady sitting behind me & my daughters, and she obviously had not read HP or seen any of the movies. When the previews were playing, "Percy Jackson & the Olympians: The Lightning Thief" showed. Naturally, they showed the part where it said, "From the producer of Harry Potter & the Sorcerer's Stone and Harry Potter and the Chamber of Secrets". This lady asked her companion, "Is that the last Harry Potter movie?". She actually thought the preview to Percy Jackson was the last HP movie. During the HBP movie, during Aragog's funeral, she said, "I don't think he's really dead". And when Snape put the Avada Kedavra curse on Dumbledore, she said, "What did he just do?" She didn't know what Avada Kedavra was. And when Snape put the Avada Kedavra curse on Dumbledore, she said, "What did he just do?" She didn't know what Avada Kedavra was. Some random lady at the movies asked me the same thing: it was really funny, and her kid looked hilarious, and tried to act like he didn't know her! But a few of my friends thought it was okay, although they repeatedly complained "They're too many spells!". They got the gist of the movie though, I think. "Oh, well, I never was there ever a cat so clever as magical Mr. Mistoffelees!" Location: Scotland or wherever Remus is! My Mum was amazed by Snape when he killed Dumbledore: "Wh...what?! I thought he was a good guy!" After the film, she was saying, "I'm sure, there's something more to Snape...there is, I know it!" She hasn't read Deathly Hallows yet, so I didn't let her know how right she was! We also both loved Rickman's delivery of a line that comes after Harry accuses Malfoy of cursing Katie Bell, by saying: "I just know it was him." Cue Rickman's voice, laden with sarcasm, "You just... know." Jo FINDS me to be in . Avatar by icandothat on LJ. I went with my friend who hadn't read the books in years, so he couldn't remember a thing apart from Dumbledore's death. He enjoyed the film and understood it with no problem at all. When the series is finished and people sit down and watch them all back to back, it would be easier to understand what is going on because the ending of HP7 would have been complete. It was interesting that my dad interpritated Dumbledore's "Severus... Please" as a plea for him not to kill him... If that makes sense. Not for him to actually kill him (Wow... I'm confusing myself) but I guess to Non-readers then thats how it is meant to be seen. It was funny in the inferni cave though, ya know the part where the inferni grabs Harry's hand... my mum jumped so much that she actually hit some random women in the face!!!!!!!! It was hillariuos. Just realised did anyone eles think that the scene in DD's office with the Horcrux talk had a massive 'Harry-is-a-horcrux' spoiler? You know when Dumbledore says something like 'Making a horcrux... leaves traces' - looking meaninfully at Harry's scar, he touches the ring, it spins, harry's scar hurts... I think, and then there is a shot of Voldemort. http://www.youtube.com/watch?v=MXXJpeNcQCs The best week of my life! Ginny and Harry were meant for each other! Rufus Scrimgeour: "Was it because Dumbledore believed that only the sword of Godric Gryffindor could defeat the Heir of Slytherin? Did he wish to give you that sword, Potter, because he believed, as do many, that you are the one destined to destroy He Who Must Not Be Named?" Harry Potter: "Interesting theory. Has anyone ever tried sticking a sword in Voldemort?" Harry- "Death's got an Invisibility Cloak?" Ron- "So he can sneak up on people. Sometimes he gets bored of running at them, flapping his arms and shrieking"
My dad watched HBP without me! We had just bought the movie and I had to work, so when I came home he's like "That was a great movie!" But he doesn't believe that Snape actually killed Dumbledore. He told me "wait until the next movie, and you'll see that he's not really dead!" lol...I even showed him DH, and he still doesn't believe it! 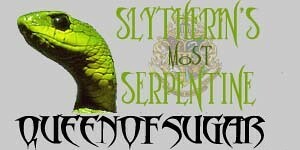 Proud to be a Slytherin! I thought this was really funny. All times are GMT +1. The time now is 8:35 am.